1. How do I choose Suspension System for my product? - Firstly you need to know the weight of your product. It’s the weight that determines the cable diameter you need, which affects what grippers that can be used. Check the guide “How to choose cable” to find out more, or download our Technical Manual for plenty of helpful tips and examples. 2. When I look at the “Grippers” pages I see many identical looking items. How can I separate them without having to click on everyone? - A hint for easier finding the item you need is to look at the article numbers, which are based on each item’s characteristic. For example; 9-38M3, 9-38M4, 9-38M5 and 9-38M6 look exactly the same on the picture. However, the last two letters M3, M4 etc show the thread of the item. On other items it says MM5 in the end (or in some cases in the middle) which means a male M5 thread. 3. I want to suspend my product from an angled ceiling. How does this affect the weight capacity? 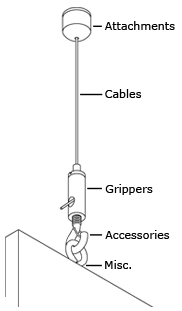 - We always recommend that the cable hang from the ceiling in a straight line from the gripper, and we have a special assortment of our product range that allows the cable to do so (e.g. grippers with angled connector or attachment cap with slit. Please look in our Technical Manual to learn more about how you can suspend from angled ceilings.